I’ve been having mixed feelings about all this pleasant weather we’re experiencing. Firstly, it’s too sunny. Unless you’re Mariah Carey, you don’t earn any friends by walking around with your umbrella up on a hot Summers day. Just ask the guy who yelled, “It’s not raining!” out of his car window at me. But all this sunshine is also allowing the balcony garden to go from strength to strength. 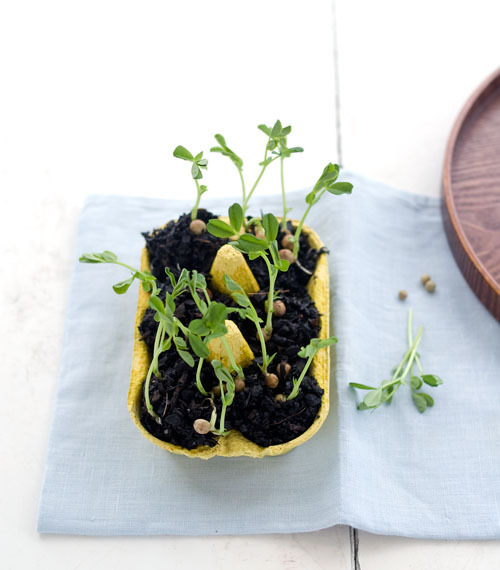 I have cress growing on our kitchen window sill, and pea sprouts planted in a random collection of containers outside. The sprouts take less than a week from planting to harvest and taste utterly delicious. Well worth the non-effort. Most of the greens have ended up on our dinner plates. Occasionally, I’ve baked herb tartlets or scones for a snack. This morning, I thought I’d give Proust’s aunt a run for her money and made a batch of savoury madeleines, flavoured with brown butter, cheese and a mixed bunch of herbs I gathered from the garden. 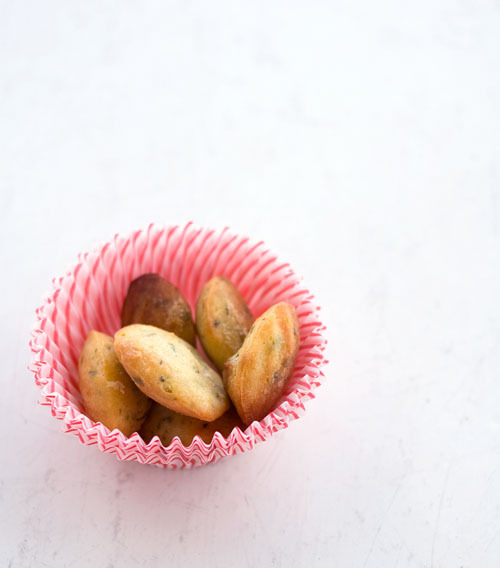 If you don’t have a mini madeleine tray, you can also bake these in small financier tins or as mini muffins. Preheat the oven to 200’C. Grease and flour the mini madeleine tray, tapping out any excess flour. Melt the butter in a small pan, cook it until it turns a nut-brown colour then carefully strain it into a bowl to cool down. Whisk the eggs, sugar and salt in an electric mixer on high until very light and fluffy. With the mixer running on low, drizzle in the browned butter. Fold in the flour and baking powder, followed by the chopped herbs and grated cheese. 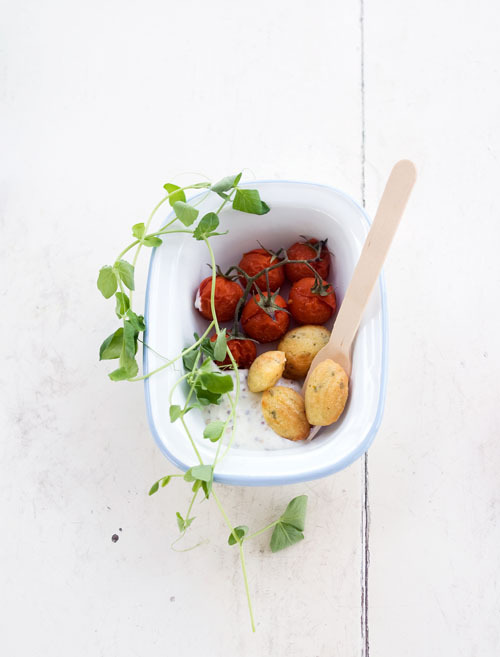 Pipe or spoon the mix into the prepared madeleine tray and bake for 4-5 minutes until cooked. These are best eaten warm. My childhood Christmas fantasy was always a Northern Hemisphere-tinged version of this ultimate holiday season. Mittens, snow, sleigh bells, mistletoe, roasted chestnuts and dried fruit puddings. It was a ‘traditional’ Christmas that made no sense in Sydney, soaked as we were in sun and sweat year after year as my father, with a paper crown lightly plastered to his forehead by effort, perspiration and steam, plunged a blunt bread knife into the roast turkey. Even with an air-conditioning upgrade, I couldn’t stomach the idea of all that hot food. We could have been feasting on chilled oysters, prawns, cold ham and salad, followed by sweet cherries and mangoes. And I suspected we often suffered from dry turkey because the beast continued cooking in the blistering Summer heat long after it left the oven. These days, our family celebrates the middle ground. Cold food, plus some hot food that if served even only moderately warm, will be no cause for complaint. People who still opt for the more traditional approach might make a concession especially when it comes to the last course. Stirring crumbled pudding into store bought vanilla ice-cream before setting it in the freezer again is occasionally made a little more fancy with the addition of booze or toasted spices to qualify it as a “recipe”. I must admit, I like this approach. Learning from past experience however, I’ve decided against transporting anything frozen to a family dinner since it often arrives in the form a puddle, forcing me to hastily reinvent my dish as a chilled custard or dessert soup. This year, if Santa doesn’t bring a heatwave, I will bake. 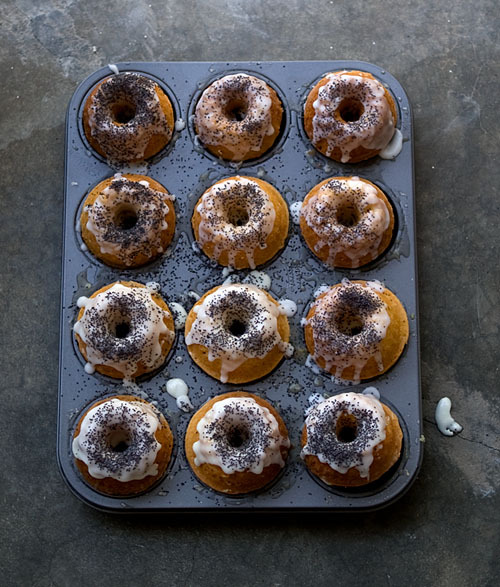 It’ll be a variation on one of my favourite recipes made extra small, extra cute and extra delicious with limes and blackberries – both of which are plentiful and cheap at the moment. Of course, there’s always a plan B, which I shall mention in my next post. What will you be baking for Christmas? The best things I ate this week? Juicy, dribbly, sweet and sour West Indian cucumber pickles, straight from the jar. Plump steamed dumplings stuffed with barbecued eel and spring onions. Misshapen blue corn tortillas piled high with ceviche, pickled jalepenos, avocado, chilli and lime. 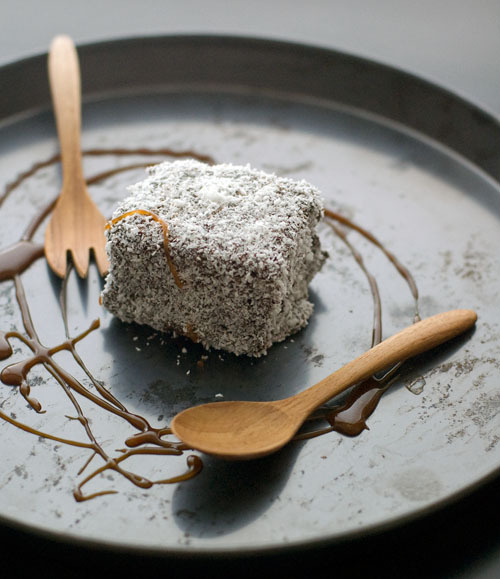 And this lamington. Turns out the best things in life aren’t necessarily always the prettiest. Whisk the eggs in an electric mixer until very light and fluffy. Add the brown sugar and salt and continue whisking for a few minutes. Sift the remaining dry ingredients over the egg mixture and fold in gently but thoroughly. 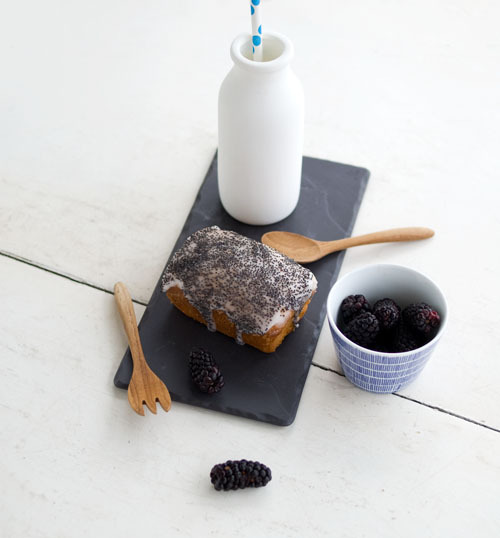 Transfer this mixture to a greaseproof paper-lined 8″ x 12″ baking tray. Bake in a preheated 175’C oven for 30 minutes or until a skewer inserted into the center comes out clean. Once the cake is cooled, peel away the baking paper. With a serrated knife, trim the edges of the cake (or leave it if you don’t mind slightly rough edges on your end product) and split the sponge in half lengthways. Spread filling of your choice on one half of the sponge. Here I’ve used a salted caramel sauce but you can also use cherry jam, chocolate custard or whipped vanilla cream. 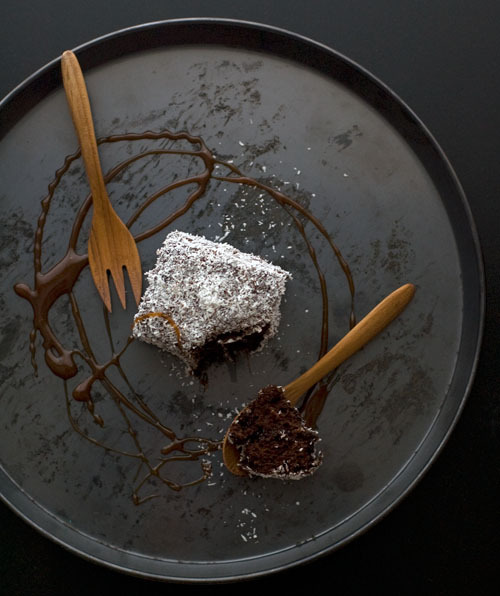 You can also skip this step if you want unfilled lamingtons. Sandwich the sponge back together and cut into as many squares as you like (12-16 squares, depending on how big you want each portion to be). 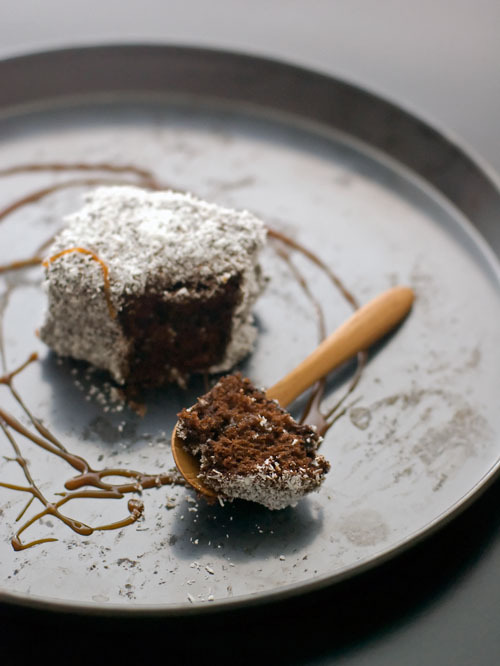 Dip each square in chocolate sauce and dredge in dessicated coconut. In a medium pan, place the brown sugar and cocoa. Whisk in the water and vanilla. Bring to boil, stirring. Allow to simmer for 2-3 minutes until slightly thickened. Strain and leave to cool before using.